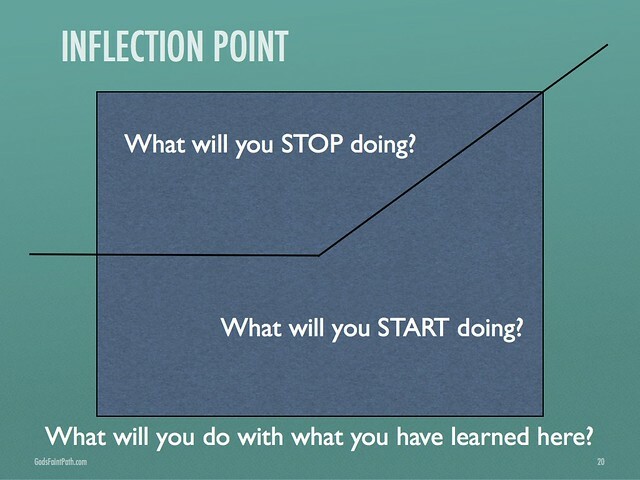 Here are the slides with narrative, and a 12 minute video, sharing the lessons of the day. 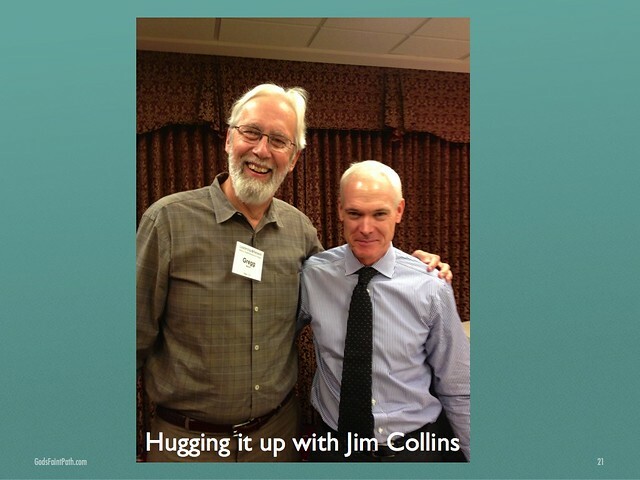 Good to Great- a day with Jim Collins from Gregg Burch on Vimeo. 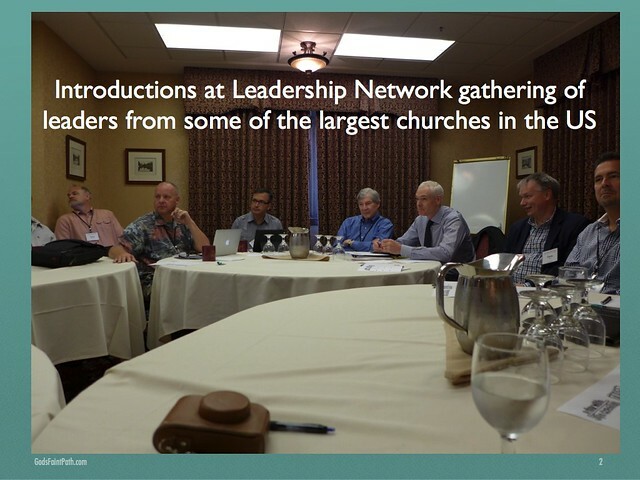 I was invited to attend a Leadership Network event in Boulder, a day with Jim Collins and 20 leaders from mega-churches around the country. My thanks to Leadership Network CEO Dave Travis for including me. 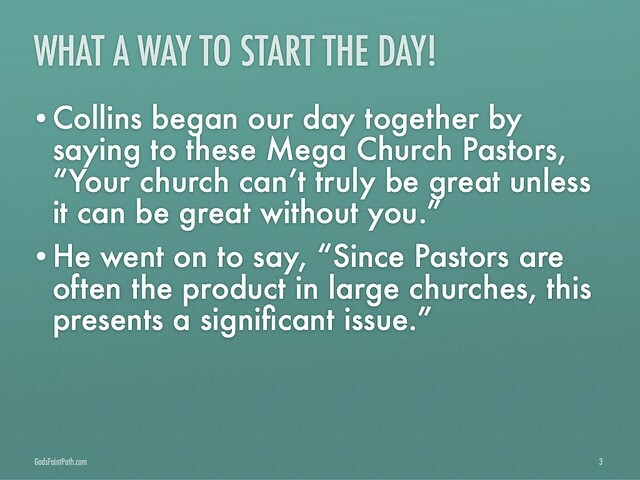 I have been a fan of Collins work since his book Good to Great was published years ago. I’ve used his book for years consulting with churches, encouraging them to ‘get the right people into the right seats of the leadership bus.’ So, it was great to meet him and hear directly from him. Preparing for the day, we read Collins’ monograph Good to Great and the Social Sectors. 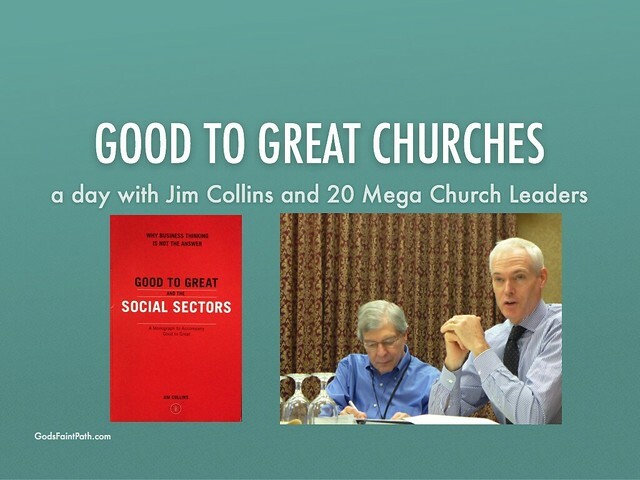 Collins translates the leadership lessons of Good to Great to be relevant to nonprofits and churches. Collins made the strong point that these are not leadership principles of business, but of greatness in any sector. Collins estimates that 30-50% of the people who read Good to Great are from the Social Sector. Collins concedes that leaders rarely have the full executive power in the social sector, calling it a ‘diffuse leadership structure.’ What that means is that church leaders have to use more of a consensus style of leadership, given the governance structure. In the monograph, he defines five issues that frame the differences of applying Good to Great in churches and nonprofits. Collins conceded that it takes more intellectual rigor to identify real results and outcomes in churches and other social sector organizations. It is an order of magnitude harder. In the past, most measures in churches had to do with butts and bucks, which are only a proxies of health. The mission is so much deeper than gathering people and money. Measuring movement towards spiritual maturity is closer to the core of the mission, and it has become much easier since the Reveal Spiritual Life Survey came out in recent years. I think about our church in this respect. 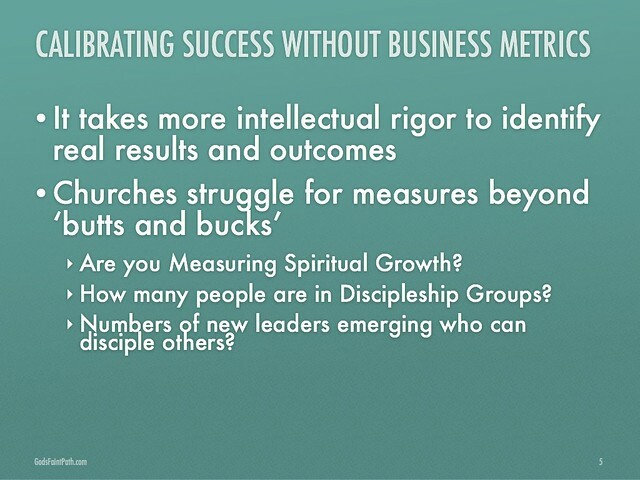 What will be the measures of success of City Church going forward? Multiplication of Leaders, Missional Communities, Spiritual Formation Groups? One key measure is the number of people being disciples in Spiritual Formation Groups, and the number of leaders that can disciple others. We still see growing numbers in worship and growth in giving as indicators that our people are inviting friends and neighbors to church, and are leaning deeper into generosity. The key question Collins asked us to consider when recruiting was, “What is the true motivation of those in power?” Those motivations will show up in decisions and actions. As you look at your organization: What is the motivation of our leaders? Is humility visible? Fruits of the Spirit visible? Collins called humility the cornerstone of greatness. 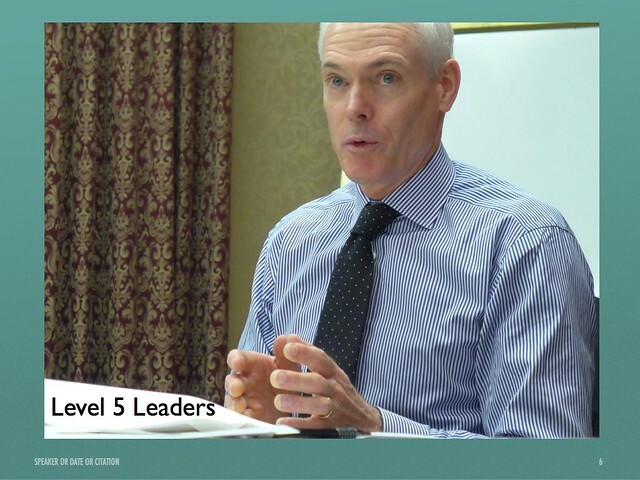 Level 5 Leaders have incredible will to act regardless of the cost. He asked us, “At the core, what are you in this for?” The Level 5 leader is in it for the mission, ambitious for the enterprise. They make tough decisions to move the mission forward. The ultimate sign of a Level 5 leader is that the organization can go on without me. Collins described these leaders in the Good to Great Monograph as compulsively driven, and productively neurotic. During the day, Collins came back to the Level 5 leader attributes and said, “Research shows great leaders have productive paranoia” assuming a posture of: bad things will happen, it is my responsibility to keep going whatever happens. He spoke about the tragedy on Mt. Everest written about in Jon Krakauer’s book Into Thin Air. David Breashears brought oxygen for three attempts on summit. When turnaround time came and he hadn’t reached the summit, Breashears went down when others kept pushing. They had just enough oxygen for one attempt, so it was Summit or Die, and several did. Collins held up his water glass and said, “I’m not a glass half empty guy, I’m not a glass half full guy, I’m a guy with a full glass who’s sure it will shatter at any minute.” That comment resonated deeply in the room. We talked about this underlying fear that something bad is lurking around the corner, and it led to a conversation about another term Collins used to describe these leaders, ‘compulsively driven.’ It seems that much of the drivenness we see in corporate America has crept into Large Church culture. 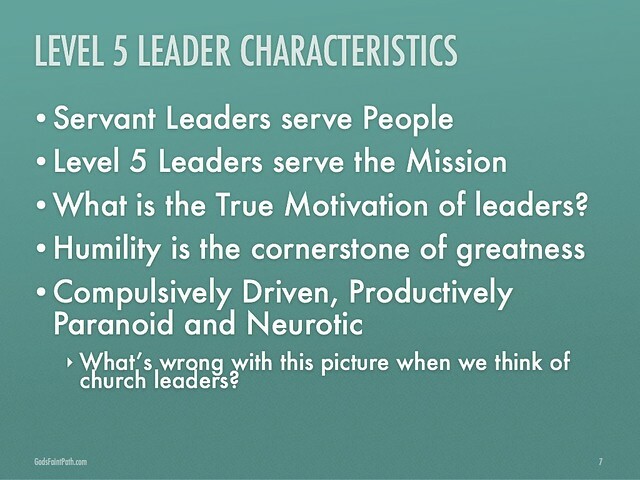 It’s not surprising, considering how many leaders in the ranks of these churches come from the corporate marketplace. When Collins opened the floor at the end of the session for questions to be discussed around the table, I asked one. “How can we disciple people into the abundant life Jesus promises us in John 10:10 if our leaders are compulsively driven, productively neurotic and paranoid?” No one offered an answer. Collins emphasized the importance of rigor in filling the seats in your leadership team. 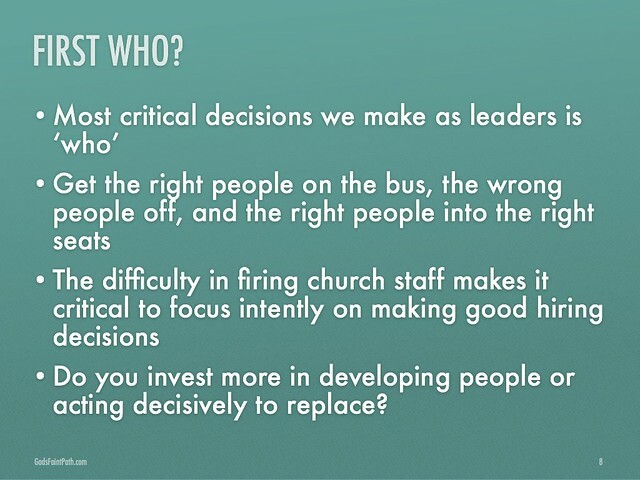 The most critical decisions we make as leaders are ‘who.’ To paraphrase Collins, ‘Get the right people on the bus, the wrong people off the bus, and the right people in the right seats. Then, with the people on the bus, decide where to drive the bus.’ So, his principle is that getting the right people on the team, and making sure they are serving in areas where they are both gifted and passionate is the critical first step for leaders. Some churches have elected leadership that can only change over time. If you don’t have the ability to pick your leadership team, you have a bus problem. If you can shape the staff and leadership in the Social Sector, do you demonstrate discipline and rigor? If not, you have a seat problem. When seeing mediocrity, do you invest more in developing or act decisively to replace? At what point should your patience wear out? How do you know? If your eyes and ears disagree, which do you follow? Collins asked: Are you too harsh and fast to act or do you wait too long? (all but one hand raised on the latter) Collins says this is true for most business leaders as well. For Level 5 Leaders, if anyone on staff impedes the cause, it’s time to go. Collins compared two companies over decades. One made much higher returns, but had large swings from profit to loss. The other grew by 20% a year, rarely more, and rarely less. Which would you invest in? Over the next decade, in a downswing, the highly profitable company crashed and burned. The other continued to grow at a steady, but slower rate. He introduced the Twenty Mile March. Think of hiking from LA to New York, with a discipline of walking twenty miles each day. Through the rain, across the desert, over the mountains, across the rivers. No matter, we cover 20 miles a day. 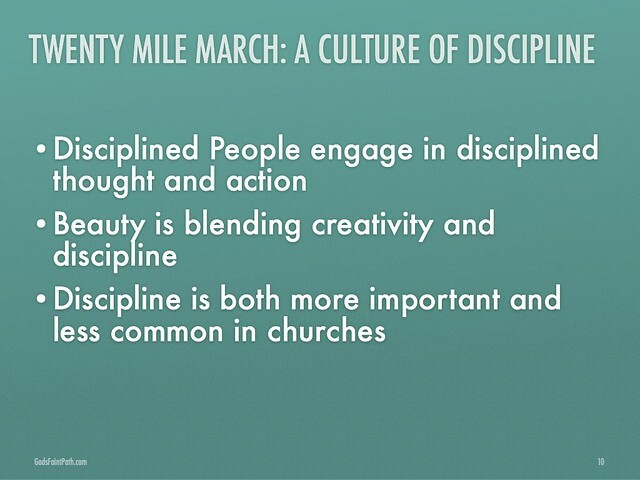 Committing to a 20 mile march ushers in discipline. What would work for you, be functional in your setting? Thinking about City Church Atlanta, these questions emerge: What does it look like for our Church? For a Missional Community? 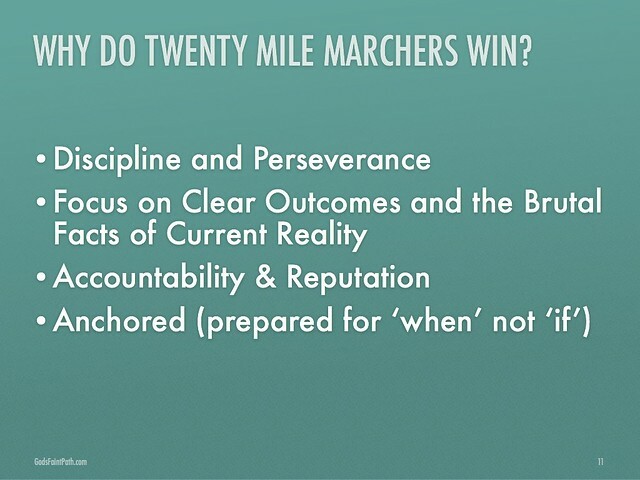 How does the idea of the 20 Mile March apply? Our vision of planting ten churches around the Atlanta Belt Line in twenty years sounds like a twenty mile march to me. It reinforces the need for great people, discipline, clarity, the power of shared vision and willingness to see reality clearly. Discipline is associated with greatness. Many businesses are terribly undisciplined. Greatness requires exceptional discipline. Early success can come without the ingredients that provide habits that bring sustainable success. Early success could come not from what you’re doing, but in spite of what you’re doing. 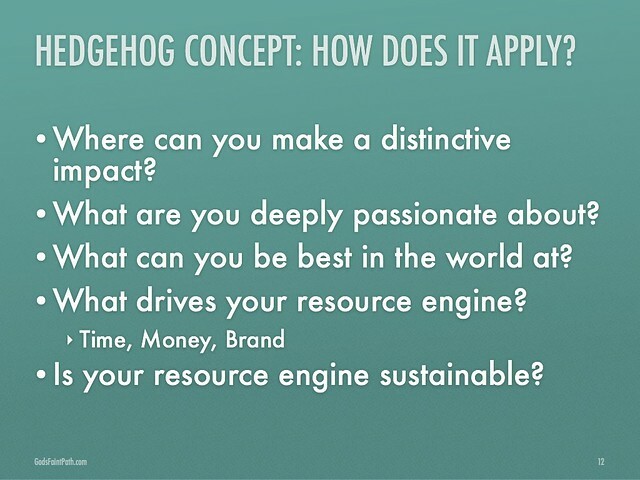 Where do we make a distinctive impact. If we go away, who will miss us? What is our unique value in our community? It’s can be easy for the pastor to be the product but difficult to successfully transition to a next generation of leadership. He reminded us that your church can’t be great unless it can be great without you. 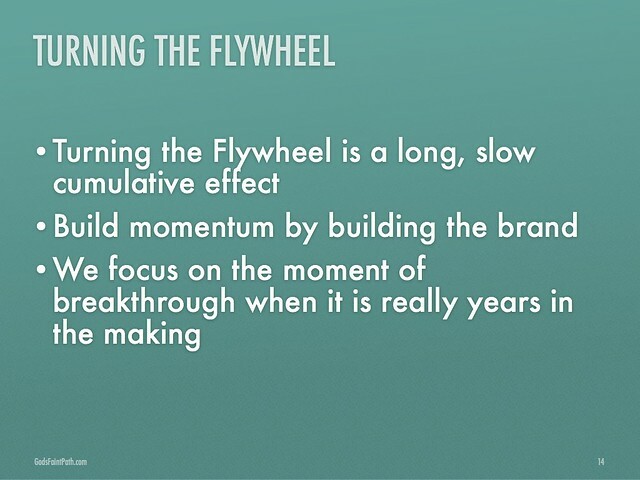 Understand that the flywheel is a long, slow, cumulative effect. We fixate on the moment of breakthrough, when the moment is years in the making. 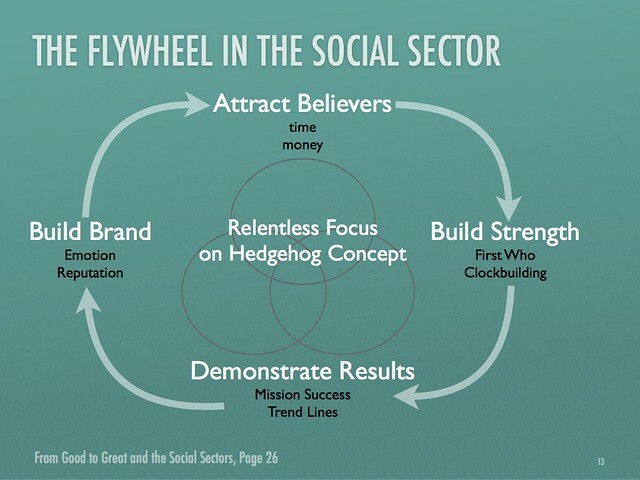 How well is the flywheel turning at your Church? 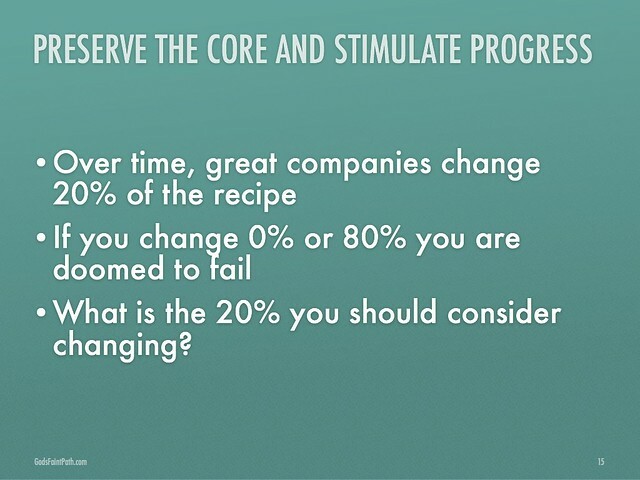 Over time, great companies change 20% of the recipe. Change 0% or 80%, and you are doomed to fail. What is the 20% that you should consider changing? Why? Ask about items in the recipe. Are any of the reasons you do this no longer valid? 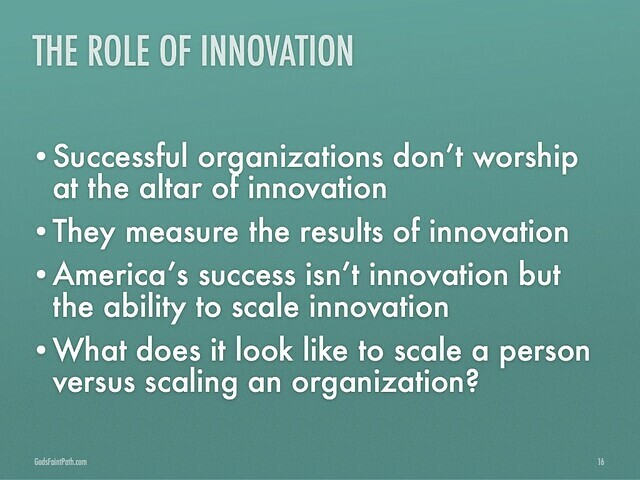 Successful companies don’t worship at the altar of innovation. They are much more empirical in measuring the results of innovation. America’s success isn’t Innovation but the ability to scale innovation. Where are the scalable opportunities that we have proven works? Multiplying discipling leaders? What does it look like to scale a person to their full potential versus scaling the organization? 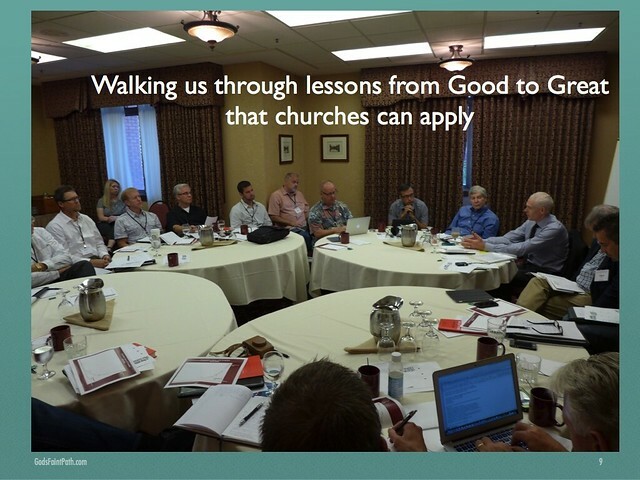 What lessons can we learn from great churches that fail? What lessons on greatness? Are we getting a Return on Miracles? Try, calibrate, try again. 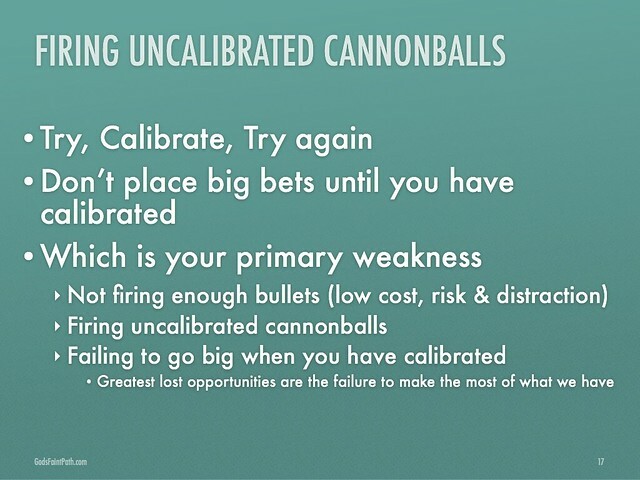 Don’t place big bets until you have calibrated. Which is your primary weakness? Failing to go big when you have calibrated. Greatest lost opportunities are the failure to make the most of what we have. 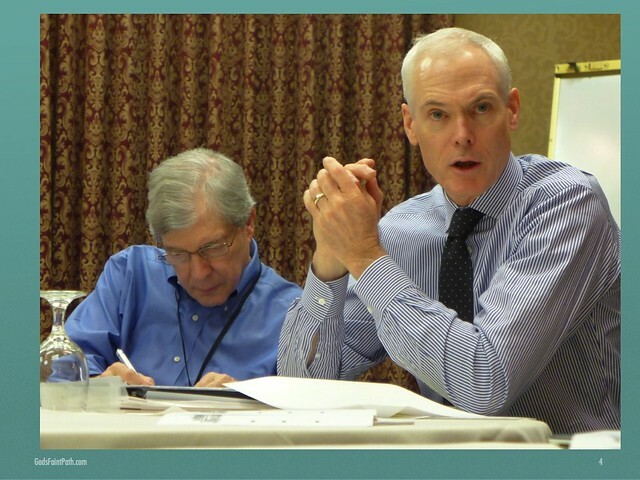 Jim Collins said to Bob Buford, “You and the Leadership Network have built the most sophisticated human enterprises in the world.” He elaborated to say that he sees a level of sophistication in understanding of organizational complexity and dynamics rarely seen in business. Dave Travis, Leadership Network CEO, closed the day by saying, “When churches flourish, communities thrive and people are enriched.” Is your church having this impact in its community?